Unless government takes bold decisions on agri-markets, reducing production costs and increasing demand, its goal to double farmers’ incomes by 2022 will remain a pipe-dream. Prime Minister Narendra Modi is one of the best orators in Indian politics today. He is not only coherent and inspiring but connects with his audience well. He is ambitious and committed to fast-track the economy. He sets high targets and drives government machinery to achieve them. In the process, he raises aspirations and expectations of people which if not met, run the risk of hurting his own and the government’s credibility. Unrealistic promises that remain unfulfilled could hurt the PM’s political capital. People could doubt his intent, his understanding of involved challenges, or the capability of his government to deliver. The case in point is his often-repeated ambition of doubling farmers’ real incomes by 2022. By all means, we want to see him succeed in his ambition. However, our analysis and professional acumen informs us otherwise. We believe that farmers’ real incomes cannot be doubled even by 2025. The target of achieving it by 2030 seems more plausible. In saying so, we run the risk of being unpopular but as Gandhiji once said, “It’s easy to stand with the crowd. It takes courage to stand alone.” And so, we gather courage to say that the ambition of doubling farmers’ income by 2022 is a pipe-dream and not a serious target. PM Modi spoke of his “dream” of doubling farmers income by 2022 for the first time in February 2016. This was repeated in successive budget speeches of the finance minister. In Ap06ril 2016, the Dalwai Committee was formed; it came out with a 14-volume report to identify ways to double farmers’ income from the 2015-2016 levels, in real terms, in seven years. Since there was no updated estimate of actual level of farmers’ incomes in 2015-16, the Committee arrived at estimates by applying net state domestic product (NSDP) growth rates on estimated state-wise farmers’ incomes of 2012-13 (from the NSSO). It found that an average Indian farmer household earned Rs 96,703 in 2015-16 (this was Rs 77,977 in 2012-13 according to the NSSO). Doubling this to Rs1,93,406 (at 2015-16 prices) by 2022-23, needed real incomes to grow at CAGR of 10.4 per cent at the all India-level, and at differentiated rates at state-level. Graph-1 compares the actually achieved growth rates in farmers’ real incomes (NSSO 2002-03 to 2012-13) with growth rates required (2015-16 to 2022-23) to double farmers’ income. States like Bihar where real incomes of farmers was at (-)1 per cent (CAGR) between 2002-03 and 2012-13 would require a CAGR of 12.3 per cent between 2015-16 and 2022-23 to achieve the government’s target. This sounds very unlikely. There are similar unrealistic expectations from other moderate-performing agricultural states like West Bengal, UP and Jharkhand. As two of the seven years have already passed and given the performance of agriculture in 2016-17 and 2017-18, the required CAGR in the remaining five years will have to be much higher than these rates. For example, instead of 10.4 per cent, the average incomes of farmers should grow at 13 per cent nationally if the goal is to be achieved. To achieve this, the Committee estimates that about Rs 6.4 lakh crore (at 2011-12 prices) is needed by the country as additional investment. Eighty per cent of this must come from the government. Interestingly, the committee does not mention how the government intends to mobilise this amount. On February 19-20, the Ministry of Agriculture and Farmers’ Welfare organised a conference, “Agriculture2022-Doubling Farmers’ Income”. About 300 stakeholders argued their case. The PM shared his aim to overhaul the agriculture sector and double farmers’ incomes through a four-pronged strategy. This involves reducing costs of cultivation (through neem-coating urea and soil health cards); ensuring better prices for produce (through new cost plus-pricing MSP formula, reforming agri-markets through e-NAM and upgrading 22,000 village-markets); reducing wastage in the value-chain (through proper storage, logistics, food processing, and implementing Operation Greens-TOP (tomatoes, onions and potatoes); and diversifying sources of farmer incomes (through blue, organic, sweet revolution). Overall, there were no dearth of recommendations. But how many of these will be accepted and implemented, and by when will they deliver, is anybody’s guess. We may differ with the PM on the number of years needed to fulfill his dream, but we are with him in his drive to double farmers’ income. For the journey ahead, we have three suggestions/questions for him. First, can he dump the inherent consumer-bias in country’s marketing and trade policies? Massive and growing food subsidies (marred with high inefficiencies) is an example of such a bias. He needs to revisit the archaic ECA, revitalise inefficient APMCs, put an end to ad hoc export bans and ensure a stable policy-environment for domestic agri-trade and exports to flourish. Second, how does he plan to absorb the production boom that will result from implementation of various recommendations? Will consumption keep pace with production? Will the solution be in processing, exports or in augmenting demand? Third, can he dump the subsidy model and embrace an investment model? 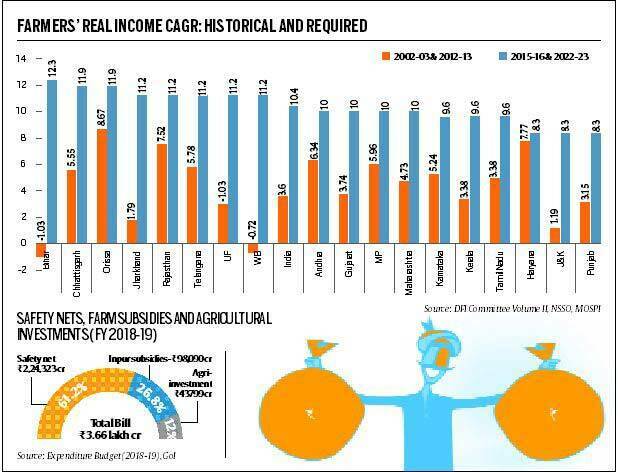 Of the total resources (Rs 3.66 lakh crores) going to agriculture (and food) (see Graph-2), can he restrict subsidies on food, MNREGA, and farm inputs to less than 25 per cent and increase share of investments in/for agriculture to 75 per cent? Unless the PM makes these bold and rational policy decisions, chances of augmenting farmer incomes are bleak, let alone doubling them by 2022-23.